Alameda Art Lab offers classes in mosaics, stained glass, fused glass and other art classes for adults and youths. We're located in Alameda, but our students come from all over the Bay Area including Oakland, San Francisco, Berkeley, San Leandro, Hayward, Marin and Peninsula. We also offer after-school classes, summer camps, birthday parties and team building events. 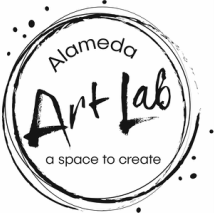 Alameda Art Lab, opened in Sept. 2016, is a space in the San Francisco East Bay for people to gather and make. We offer classes and workshops for adults as well as a variety of after-school classes and camps for youths. It is headed by JaYing Wang, a mosaic and glass artist, art teacher and business owner in Alameda for over 15 years. Throughout those years, she has taught thousands of students the art of mosaic, stained glass and fused glass. JaYing and her extremely talented team of teachers at Alameda Art Lab will offer classes in glass arts, painting, sculpture, graphic design and much more to children and youths as well as adults! Our sister business, Artistic Home Studio & Boutique, shares our space with us. Check out their furniture painting schedule of classes. And we have a BOUTIQUE selling unique hand-made items made by local artists.